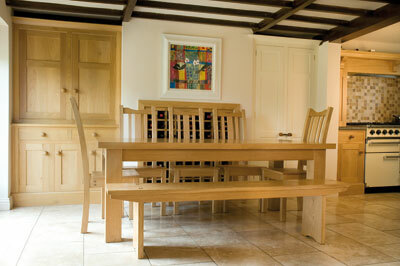 The clients wanted a chunky-looking table in oak to match a recently fitted oak kitchen, to measure 2 x 1m. 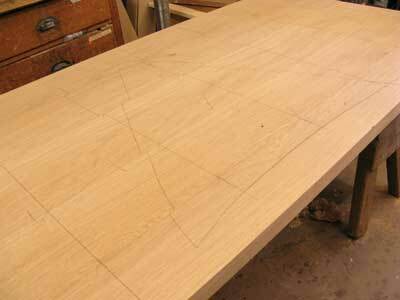 They wanted crown-cut oak because, they said, the markings in quarter-cut "look like stretch marks". I can see what they mean! I was also to make five dining chairs and a bench to accompany the table. The legs, being 120mm square, need to be laminated, and in this situation I like to use 4mm saw-cut veneers to cover two sides of the legs. In this way, the laminations can be disguised. The three core laminations are jointed to give a thickness across the laminations about 2mm greater than the required leg thickness and about 6mm less than the leg thickness in the other dimension. The core is then planed up square and to dimension and the cover veneers applied. Prepare the three core laminations and ensure that the jointing surfaces are flat and free of machine planing ripples. The joints are reinforced with two 6mm ply splines. 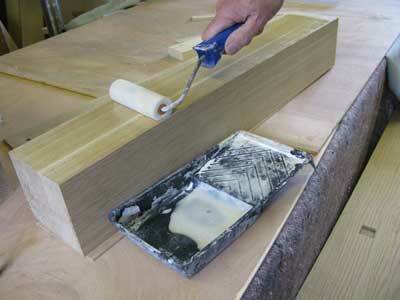 After a dry run, glue up the laminations with Cascamite applied with a small paint roller. 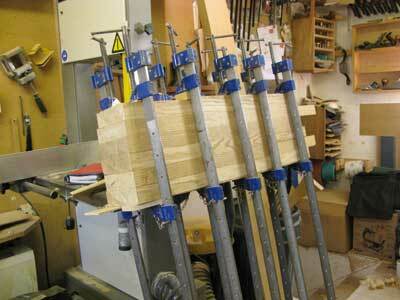 To speed things up it is possible to glue up two legs in one set of clamps, photo 2. When the pieces come out of the clamps, plane them square and to dimension; this will be the final dimension across the laminations, but less 6 mm between the faces to be veneered. On the bandsaw, deep-cut the 4mm leg veneers about 4mm wider than the leg, preferably from a single board to ensure grain and colour match. Fit a new 3 or 4tpi skiptooth blade and a deep false fence clamped to the saw table. Each cut is made with a planed surface against the fence, photo 3, so the stock needs to be resurfaced after each one. To aid matching, stack the veneers in the order they come off the stock; a triangle drawn on the end of the stock before cutting will assist in this. Leave the veneer with one sawn side, this being planed off after it has been glued to the leg. The veneer can be glued to the legs using either a vacuum press, photo 4, or sandwiched between 18mm MDF boards using lots of clamps. If using the vacuum press it is possible to do all four legs in one go; however, spacers are required to keep the legs from sliding together and displacing the veneers when under pressure. Beware: the pieces react differently in the vacuum with adhesive lubricating the surfaces than when they are dry. 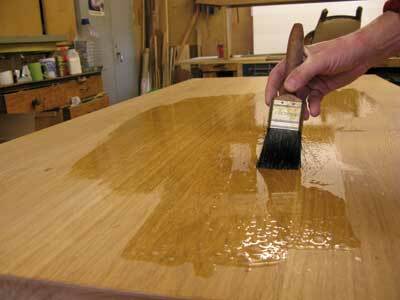 After gluing, photo 5, clean up any overhanging veneer using a hand plane, then surface and thickness the veneered sides. Trim the legs to length to complete the lamination of the legs. Using this method allows the production of 'chunky' legs with a uniformity of grain on all faces. The rails have a 10mm applied bead to the lower edge, so the actual rail piece is only 91mm wide. 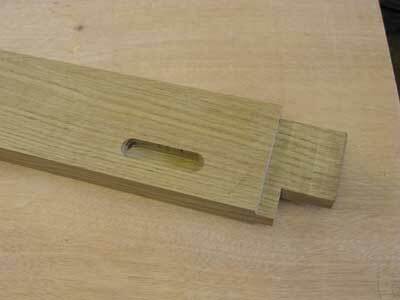 The rails have a simple haunched mortise-and-tenon joint into the legs. 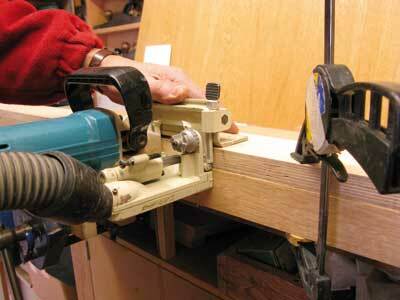 Do not cut a shoulder on the bottom of the rail because the applied bead will form the shoulder. Start by chopping the 50mm deep x 20mm wide mortise, either using the mortiser or by drilling with a Forstner bit and chiselling out the waste. 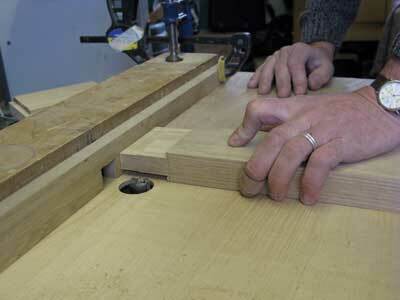 The tenons are cut on bandsaw and router table. The bandsaw quickly removes the waste leaving the tenon slightly oversize, while the router table accurately cuts the tenon to a snug fit. 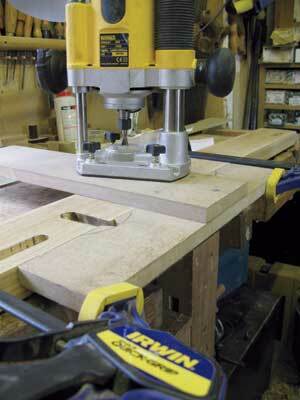 Set up the bandsaw to cut the tenon cheeks about 2mm oversize. 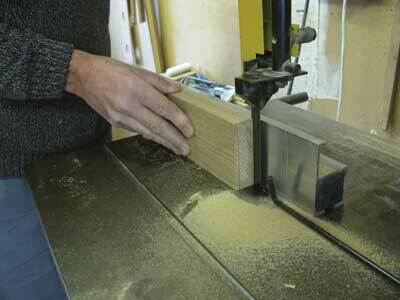 Using a stop helps to make the cut quickly and accurately, photo 6. Set the mitre fence at 90 degrees to cut the shoulders about 2mm shy of the line. I have found that the router table is the best tool to cut an accurate tenon; however, this is dependant on the table being accurate itself. 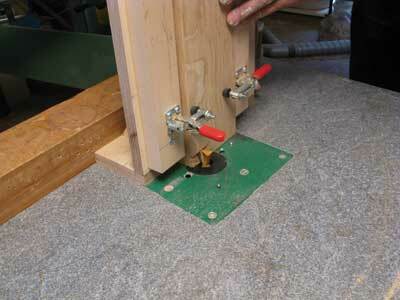 Often the surface of a router table is not true, and the best way to deal with this is to use a false top; a piece of 6mm MDF drilled to accommodate the cutter is adequate. I do not have a sliding fence on my router table, so to ensure the shoulder is cut square I hold the rail against a square sacrificial piece to slide it along the fixed fence, photo 7. Finally cut the haunch at the top of the tenon on the bandsaw. A central cross rail dovetails into the side rails. This may not be absolutely necessary as the thickness of the rails will probably provide the required stiffness, but my innate caution meant that I decided to include a cross piece. I used a 22mm dovetail bit to take a single cut with the router running against an MDF straightedge clamped square on the rail, photo 8. The dovetail groove is stopped 15mm short of the bottom edge. 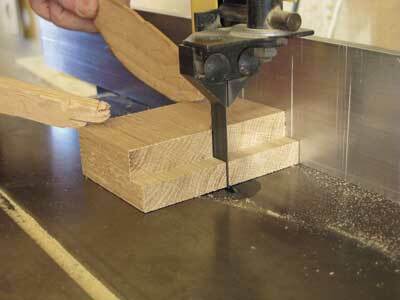 Depending on the sharpness of your dovetail cutter you may need to take a first cut with a narrower straight-flute cutter before forming the dovetail slot. The dovetails on the end of the rail are cut using the same cutter on the router table; the higher and squarer the fence the better, photo 9. Make test cuts on offcuts of the same width to get a snug fit, again correcting any inaccuracies in the table surface before making the cuts. A square sacrificial board similar to that used when routing the tenons is useful here to ensure the piece is fed over the cutter squarely. Rout slots on the insides of the rails to receive the securing blocks for the top, photo 10, three along each long rail and two on the short rail, photo 11. An additional fixed block will be screwed to the central cross rail when the top is fitted. It is easier to assemble in two parts, the short rails and legs first, then after they have set the long rails and the central one. 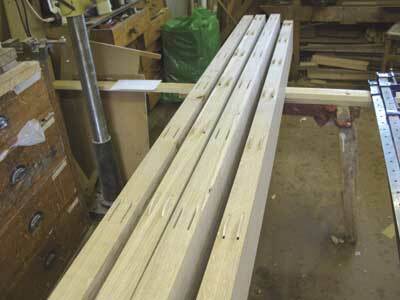 The bead pieces can now be fitted to the bottom of the rails, glued and cramped. The top is a substantial 52mm thick, machined about 50mm over length from 64mm boards. I used five boards of around 200mm wide. At this stage the total width should be a little over the final width. Most people spend a lot of time deciding on the orientation of the boards and I am no exception. There are many competing considerations to take into account. Sort through the boards looking for surface shakes, knots and sapwood and mark up which is the better surface on each board. Now, with the best surfaces uppermost, try to assemble them so that the annual rings alternate on the ends of the boards - happy and sad as I call it! - and the grain matches at adjacent edges. It is at this point that some compromises may have to be made; it may be that to get the best grain match the happy and sad rule has to be broken - but try to limit this to just the one board - or a less attractive surface be placed uppermost. Once you have decided on orientation mark the boards with a large triangle to aid reassembly, photo 12. You will have previously surfaced the edges of the boards, but this is not usually enough for edge jointing so lightly plane the edge of each joint to remove the planing marks, photo 13, then lay the joint together with a light behind to check for gaps; aim for a slight gap in the middle which will close up with firm hand pressure from above. Also check that the boards are in line by setting a ruler against the faces. When all the joints are correct do a trial clamp up to ensure that the joints close up, and checking for flatness with a straightedge. 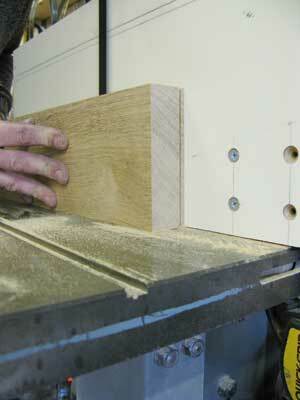 If all is well measure off the width and make adjustments on one of the outside edges to achieve the final width. The boards are now ready for biscuiting. Previously I have used 6mm ply splines similar to the leg joints but have now decided this is overkill on these narrower joints. 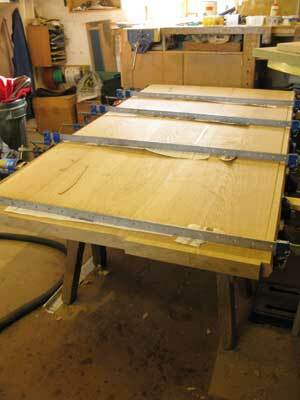 Instead I use double No 20 biscuits at about 400mm spacings, photo 14.
the higher cuts. Dry assemble the top to check for flatness and that the joints close with no gaps. 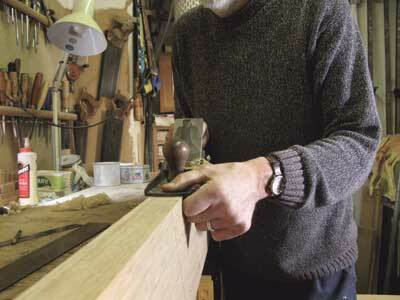 It may be necessary to part the boards with a chisel to disassemble, hence the boards being a bit overlength. Start the top flattening process by planing diagonally or even across the grain with your longest plane; If the biscuiting was accurate there should not be a great deal of unevenness to overcome. 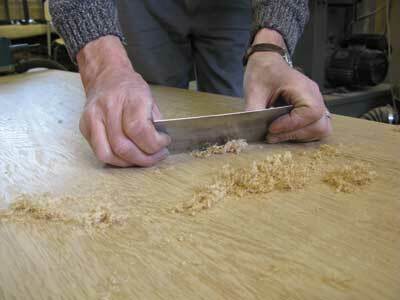 After planing you may want to use a cabinet scraper or scraper plane, photo 18 - the less purist may go straight to the belt sander. During all these operations keep checking with a straightedge for any unevenness in the surface. If you have a blemish to remove do not work just on that spot but also in a large area around it otherwise you will create a depression which will become evident when the polish is applied. After flattening, trim the ends to final length, using a 2mm radius rounding-over bit in the router to arris the edges of the top. The top is fitted to the undercarriage by fixing blocks located in slots in the rails. There is a saying, 'Poor preparation leads to pretty poor performance', or words to that effect! With finishing I am living proof of the truth of that dictum. Somehow I cannot get excited about finishing, so I am afraid that I do not give it the attention it deserves. 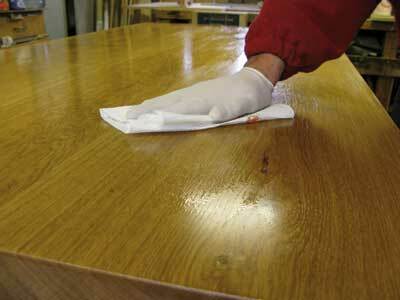 On this table there was a blemish in the centre which I worked on with a scraper and belt sander etc. I thought I had removed it without creating any unevenness in the surface, but after a few coats of the polyurethane finish described, see panel below, an imperfection started to become evident, so I tried to remove the imperfection and refinish locally, but the difference between the patched finish and the rest of the table was still slightly noticeable. I ended up having to strip off all the finish and start again, in so doing wasting a lot of time because I had not been diligent enough in my preparation. The customer was pleased with the table; it was a simple piece which fulfilled a simple specification. The next job was to make the chairs and bench to go with it. "It was a simple piece which fulfilled a simple specification"
Dry assembly just before gluing up should be the first time the whole assembly comes together. It is a mistake to assemble and dismantle pieces repeatedly because each time a joint is fitted together it slackens; however it is essential that a dry assembly is done. Gluing up is a stressful time anyway, not helped when you find that a joint is not closing up as you expected and there is glue all over the place. With the piece dry assembled, check each joint to ensure it is closed fully and also check the diagonals to ensure that any frames will go together square. Dry assembly also allows you to work out the best way of assembling and ensures you have the right clamping blocks and clamps ready. 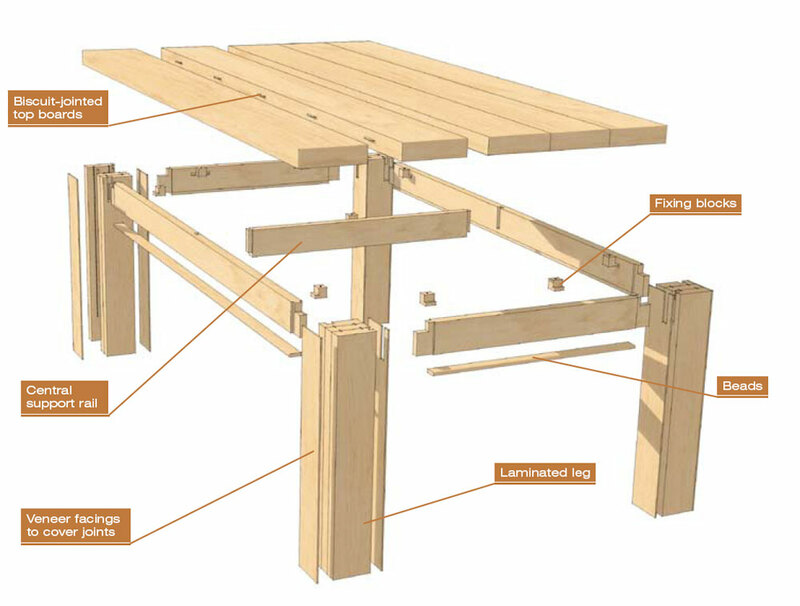 The design of conventional tables of this type is usually a compromise between providing enough thigh clearance and enough depth to the rails to give strength. 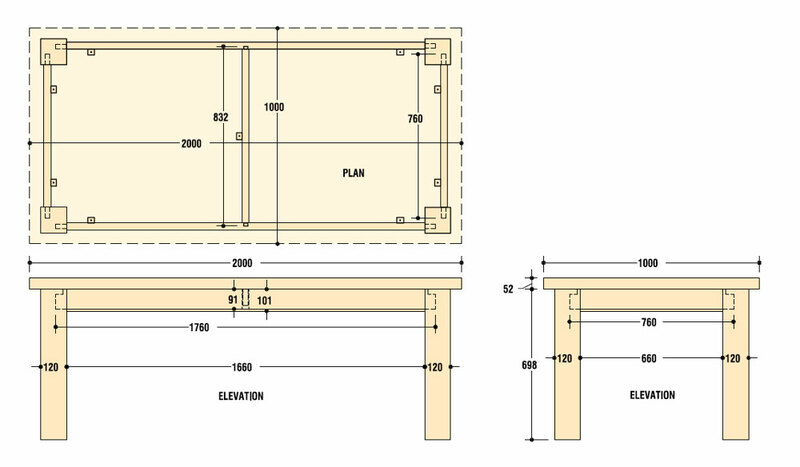 A look in Garth Graves' The Woodworkers Guide to Furniture Design tells one that dining table height should be between 736mm and 762mm, and for the average person the thigh clearance should be from 559mm to 597mm. As this is reducing the width to the absolute minimum structurally, I gave them a chunky thickness of 32mm. One of the problems with gluing up a top of this size is the time taken to get all the joints together; the glue may have gone off before you get the whole lot clamped up. So, after getting half the boards together clamp them up tight while the rest are assembled, then reclamp the whole lot together, photo 16. You could glue them up in two parts and then glue the two halves together, but this greatly increases the time involved. 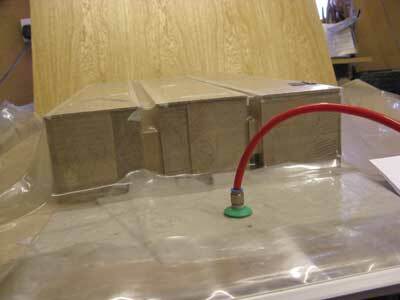 Alternating the clamps above and below the top helps to ensure even pressure and a flat surface. 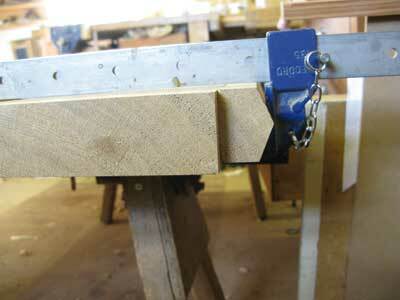 Shaped clamping strips are also helpful. Make up a strip with a pointed back edge such that the point will be central to the edge of the board, this ensures that clamping pressure is through the centre of the boards. Using clamping strips rather than blocks also speeds up the clamping process as you just have two strips rather than having to juggle lots of separate blocks, photo 17.